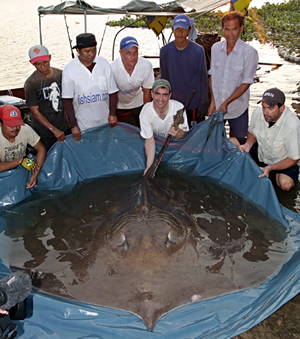 Our Guided Stingray Fishing holidays are probably our most popular fishing holidays. The package that we offer the visiting angler sets them up with a chance to fish for what is possibly the largest freshwater fish in the world, the legendary Giant freshwater stingray, Himantura Chaophraya. Please read below for some exciting stories of Giant Freshwater Stingray Encounters by visiting anglers then please contact us to find out how we can help you to emulate these magnificent captures. Fishsiam provides daily tours and weekly fishing holidays in Thailand, fishing for the legendary Giant Freshwater Stingray in the Maeklong river. 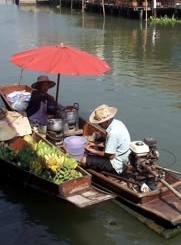 Our guided holidays and tours are inclusive of return transfers of around 1.5 hours from Bangkok. On arrival at the Maeklong River near Samut Songkran, anglers board our fishing boats before being transported to various parts of the tidal river to fish for Giant freshwater stingrays that lurk there. 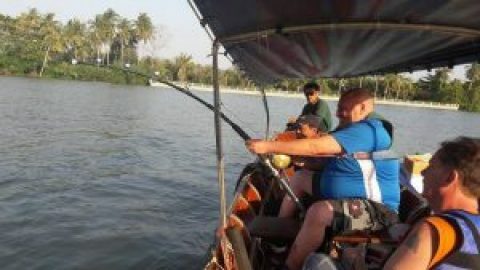 Visiting anglers on our guided Thailand Stingray Fishing holiday packages on the Maeklong river fish from aluminium skiffs each fitted with an engine and fighting gimble. Each team of experienced stingray fishing guides is composed of captain and guide(s) on the main fishing boat in addition to two additional smaller boats which are used for bait placement etc. 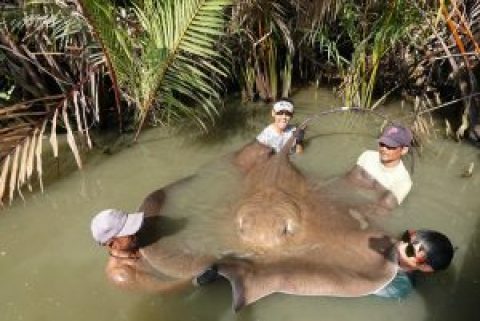 When you are stingray fishing in Thailand with Fishsiam, the guides that you will be fishing with are only the most experienced guides who are veterans of literally hundreds of battles with monster Giant freshwater stingrays, you will be in the best and safest hands. Only the strongest big game fishing gear is suitable for stingray fishing in Thailand with Okuma 130lb class stand up rods twinned with Okuma Makaira multipliers and 200lb mono as standard. We use 10/0 Owner Circle SSG hooks with various live and deadbait’s and large custom made 1kg weights to hold bottom in the powerful tidal flow of the Maeklong River. 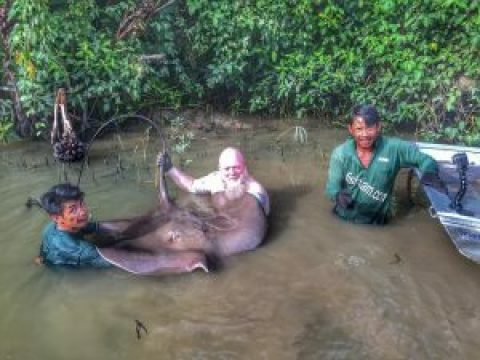 Battles whilst Giant freshwater stingray fishing in Thailand are quite often epic and protracted affairs lasted several hours in duration and sometimes requiring multiple anglers to successfully land the Giant stingrays. Clients are guided through every step of the battle by our pro fishing guides who will also assist in the netting, handling and release of the fish. In the event of bringing a large freshwater stingray up alongside the boat our guides will unfurl a large net under the stingray before carefully wrapping/bandaging the barb on the stingrays tail. The fish is then transported to the riverside and allowed a short period for recovery and photography. Our Thailand stingray fishing holidays and daily tours at the Maeklong River allow clients to catch a three fish per day limit in an effort to reduce any impact on the resident Giant freshwater stingray population. In the event of not reaching the three fish limit ,the duration of our daily stingray fishing trips last eight hours. Fishsiam Thailand Stingray fishing trips at the Maeklong River are timed to coincide with lunar phases and information gleaned from tidal charts concerning tidal movements affording anglers fishing at this tidal river the best opportunity to do battle with what is widely regarded as the largest freshwater fish on the planet! The duration of our daily Stingray fishing trips at the Maeklong River is eight hours excluding transfers from Bangkok (approx 1.5 hours) or alternatively end after catching your three fish limit per day. The town of Samut Songkran dominates the landscape in the lower reaches of the Mae Klong river, on one bank is a thriving and bustling rural town with strong fishing history and ties. The town of Samut Songkran is a perfect example of a rural Thai fishing town with markets and food vendors on every street corner.The opposite bank of the tidal river is lined with rustic stilted riverside dwellings constructed from local wood which house a mixture of fish farmers who rear Barramundi in floating riverside pens and various local fishing families who rely on the river to survive.Large industrial fishing boats move regularly up and down the lower reaches of this beautiful river travelling back and forth to fishing grounds out in the nearby Gulf of Thailand before returning with their bulging nets to sell to the local fish markets.The Maeklong River in its lower reaches is a highly scenic and atmospheric fishing location which is bordered by a myriad of stunning Buddhist temples and is a site of great natural beauty and religious interest. The Maeklong River in its estuarine lower reaches in addition to the stingrays sustains an enormous ecosystem of exotic flora and fauna along its muddy riverbanks in addition to being home to a wide variety of rare and exotic wildlife such as Monitor Lizards, Fish Eagles, snakes, jelly fish and crustaceans. A trip to Amphawa floating market is a must for the visiting angler and will reveal a plethora of local products ranging from freshly cut flowers to deep fried insects and freshly caught fish and shellfish which has been caught freshly from the river.Vendors at Amphawa floating market sell their wares from small boats moored up alongside a klong (small canal) adjoining the main river. The floating market is only open at weekends and can be easily included in a stingray fishing holiday at the Maeklong River. Another attraction at the Mae Klong River not to be missed is a trip to view the many fire flies in the adjoining canals which can easily be included in your daily or weekly fishing holiday. 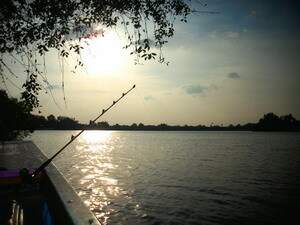 Visitors to the Maeklong River near Samut Songkran will be surrounded by some breathtaking scenery and treated with a multitude of wildlife whilst fishing this mighty tidal river. Whilst fishing at this scenic and enchanting holiday destination anglers will be treated to a glimpse of authentic Thai culture and cuisine against a backdrop of never ending sunsets and a multitude of sacred gold encrusted temples which adorn its banks. Fishsiam Thailand can arrange various accommodation ranging from teak bungalows situated on the riverside to more luxurious hotel lodgings. We offer daily and weekly Thailand stingray fishing holidays at the Maeklong River which can be combined with stingray fishing at the Ban Pakong River or any of our other Thailand fishing venues. The world famous Maeklong River in Samut Songkhram Province in Thailand is one of the most beautiful and atmospheric fishing destinations in Thailand offering possibly the best freshwater stingray fishing in the world. The Maeklong River has been scene to numerous high profile captures of monster stingrays and has seen Fishsiam Thailand fishing guides fishing with Jeremy Wade for River Monsters Death Ray, Zeb Hogan Monster Fish , Jakub Vagner Big Fish Man and various other television networks. The Maeklong river in its lower reaches dubbed Area 51 has been the scene of numerous epic battles with monster stingrays and has seen Fishsiam Thailand land several stingrays of world record size.During the filming of Monster Fish Giant Stingray, with National Geographic and Zeb Hogan in 2009 Fishsiam Thailand landed and tagged a huge Giant freshwater stingray estimated to weigh possibly as much as 300-350kg’s. 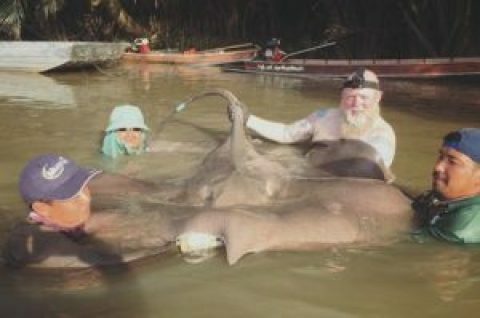 The same stingray was caught again almost exactly one month later at a similar weight some distance down river whilst filming another Stingray fishing show with NHK from Japan. 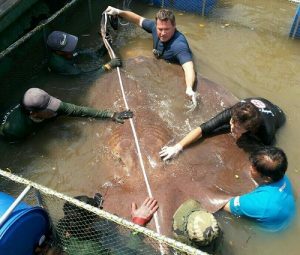 Another Thailand stingray fishing trip at the Maeklong River with US conservationist Jeff Corwin in 2015 whilst filming the Ocean Mysteries series for ABC saw Fishsiam Thailand guides another massive Giant freshwater stingray estimated to weigh 350kg+. This fish has been widely acclaimed as unofficially being the largest freshwater fish ever landed on rod and line! In this amazing episode (full version) of Catfish World, Yuri Grisendi fight a really monster stingray over 530 pound. After one hour and alf fight, the monster fish show his impressive dimensions (4×2 mts) to the camera. The giant Freshwater StingRay is a amazing fish that leave in the delta of Maeklong river in Thailand near Bangkok.